President Uhuru Kenyatta with the First Lady Margaret Kenyatta at Royal Club in Nairobi on July 03, 2018. 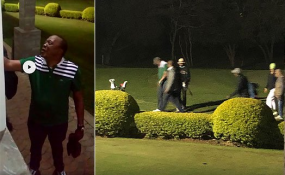 President Uhuru Kenyatta was on Tuesday spotted at Royal Club in Nairobi playing golf at night. The club, one of the oldest in the country, is located along Muchai drive off Ngong Road. The President was accompanied by the First Lady Margaret Kenyatta and an entourage. The President is known to often play a round of golf. In February, the head of state surprised many Kenyans when he said that golf should be introduced in public schools as a way of developing the sport. He urged the Ministries of Sports, Education and Interior to finalise the development of a curriculum that will see golf introduced to public schools. He also assured skaters -- who attended the flag presentation ceremony -- that they would be provided with space to train and compete at the Moi International Sports Complex, Kasarani.